The highly-anticipated update of the Alfalfa Compendium includes five new diseases, new coverage of pests, and nearly 250 new color photographs in an attractive, easy-to-use new format. The Compendium of Alfalfa Diseases and Pests, Third Edition, is the most comprehensive diagnostic reference guide to date on the many diseases and insect pests of alfalfa, one of our most important forage crops. This easy-to-use book includes comprehensive diagnostic and management information on nearly 50 infectious diseases, non-infectious diseases, insect pests, and abiotic conditions (like herbicide injury). 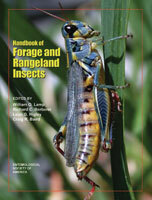 This third edition, written by more than 55 expert plant pathologists and entomologists working on alfalfa, delivers an almost entirely new collection of nearly 250 color images, revised management information, the addition of five recently discovered diseases, and an new section covering alfalfa’s arthropod pests. Some pests can significantly decrease yield and this new section describes and illustrates their life cycles, behaviors, and damage symptoms, along with management practices. 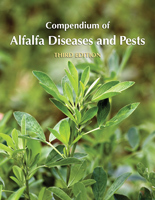 The Compendium of Alfalfa Diseases and Pests, Third Edition is essential for researchers and practitioners worldwide. Extension scientists, consultants, field staff, and growers will find the book helpful for identifying and managing alfalfa pests and disorders. Plant pathologists, entomologists, and technical staff in laboratories, diagnostic clinics, regulatory agencies will find this book to be an invaluable reference. Section one addresses the commonly occurring infectious fungal diseases of alfalfa, grouped by leaves and stems, lower stems and crowns, and crowns and roots. This section also provides information on bacterial and mollicute diseases, diseases caused by viruses, and those caused by nematodes. The parasitic flowering plant dodder is also discussed. Section two covers arthropod (insect) pests, detailing their life cycles, damage, identifying features, and management. This section describes arthropods that feed on foliage, including many kinds of aphids and caterpillars, crickets, grasshoppers, leafminers, plant bugs, spittlebugs, and weevils. Root and seed pests are given special sections, as is a livestock pest, the blister beetle. Section three, titled ‘Noninfectious Diseases and Abiotic Conditions,’ discusses the effects and management of genetic variations and abnormalities, herbicide injury, high-temperature flooding injury, nutrient deficiencies and toxicities, foliar freeze injury, and winter injury. The appendix presents an updated list of common names of diseases of alfalfa caused by microbes, nematodes, and viruses, as well as arthropod insect pests of alfalfa. Diseases Caused by Rhizoctonia spp. "Researchers, extension personnel, and growers alike will find this offers clear discussions and an approach that lends to both understanding underlying causes of alfalfa diseases and pest intrusion and how to manage them."